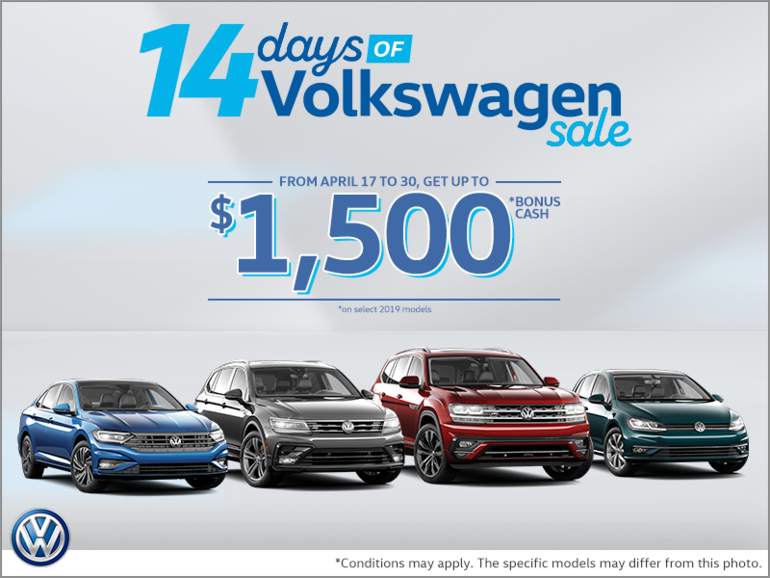 14 days of Volkswagen Sale! Get up to $1,500 bonus cash on select 2019 models! Golf Alltrack and Jetta models. Dealer may sell or lease for less. Dealer order/trade may be necessary. Bonus cash offer valid from April 17 to 30, 2019 and is subject to change or cancellation without notice. Visit vwoffers.ca or your Volkswagen dealer for details. “Volkswagen” and the Volkswagen logo are registered trademarks of Volkswagen AG. © 2019 Volkswagen Canada.